On Tuesday Morning, I told you about 15 Arab Muslim students at Dearbornistan’s Edsel Ford High School, and the sweartshirts they made glorifying the 9/11 attacks in which nearly 3,000 Americans were murdered by Arab Muslims just like the students. I told you that the sweatshirts were in solidarity with other Muslims, and NOT the victims of 9/11, and were made because of the Islamic terrorist attack by Umar Farouk Abdulmutallab on Northwest Flight 253, which occurred while these Arab Muslim students were away on winter break. Many commenters from the left, from the Islamic community, and within the dimwitted dhimmi community of non-Muslim appeasers of Muslims at Edsel Ford, all attacked me, telling me some BS story about how the t-shirts were about unity with the class of 2011 (and, yeah, every class puts windows in their class year numbers to make them look like the Twin Towers, right?). And virtually every mainstream media report went along with that phony story, all reporting that the students “made an innocent mistake,” didn’t mean it, etc. They all echoed the well-fertilized statements of Dearbornistan Public Schools dhimmi-wit spokesfidel, David Mustonen. Another student told Local 4 the design was made out of frustration over some media portrayals of Arab-Americans in the wake of the Christmas day terror attack. Yup, just as I said, it was no mistake. And it was hardly innocent. And it certainly wasn’t about solidarity with the class of 2011, just solidarity with the hijackers of 9/11 and the terrorist on Flight 253. Simply disgusting. But this is Arab America. Time to wake up to it. These kids were ten when 9/11 happened, but teens just over a week ago when Flight 253 happened. They’ve been taught at home by their Arab Muslim parents (and by their Muslim imams at their mosques and the others in their community) that this is okay, that this is what they should celebrate, just as American Arab Muslim men their parents’ age cheered and high-fived the 9/11 attacks as they worked at a Detroit-area Ford engine plant. And instead of condemning this disgusting t-shirt, 300 uppity American Arab Muslim parents from Dearbornistan crowded a Dearborn School Board meeting held to discuss the sweatshirt incident, largely to defend these Arab Muslim students. That’s why they aren’t being suspended or facing any disciplinary charges. About 300 people packed a public meeting in Dearborn to discuss the incident. The meeting centered on opening up a dialogue about the student’s actions. In 1940, if we had responded to 15 German-American Bund-supporting students, by opening up a “dialogue” or debating the merits of human lampshades, I would never have existed and my ancestors who survived would be ashes from ovens. And the rest of you would be saluting the latest Fuhrer. Clearly, they’ve won. And–to a great extent–those sweatshirts are right. We can’t “bring them down.” We simply don’t have the guts. We’ve allowed them to win. They have critical mass in that school district and someday–sooner or later–they’ll have it in your school district and school districts all over America. And the usual idiots will come out to defend them, like they did on this site. We saw the same thing happen in Nazi Europe, as 20% of the population helped round up Jews and put them into ovens because no-one was brave enough to stop them. Sadly, no-one is brave enough to stop these Muslims here today in America–the same Muslims whose fellow co-religionists had two SS units and a top Islamic cleric (the Grand Mufti of Jerusalem) beg Hitler to finish the Final Solution more quickly and export it to the Middle East. Now the Islamic solution has reached critical mass in several American cities. Will yours be next? What will you say when your school district does nothing about students belligerently and in-your-face praising the mass murder of 3,000 Americans and the attempted underwear bombing of hundreds more? Will you look away, and just dismiss them as innocents? Will you look away when you have to do so from under the cover of a burqa or niqab? You may not see it in you lifetime. But if you do nothing, your grandchildren or great-grandchildren will. And then, it will be too late. That these 15 Arab Muslim students can get away with celebrating the murder and attempted murder of Americans shows us that it’s too late, already. A first baby step in fighting this is exposing the students who made and wore the sweatshirts to school. We now know the full name of one of them, Wadhah Almadhagi, and the first name of another, Loui. 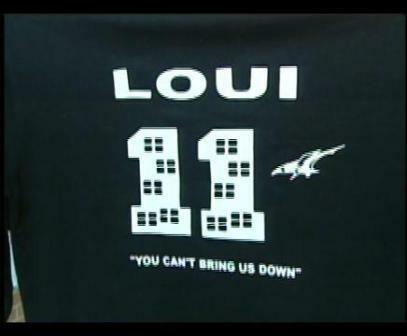 If you know Loui’s full name and those of the other 13 Arab Muslim students who wore these sweatshirts, please post them in the comments section and/or contact me, with details about these men and who they are. And contrary to Ms. Almadhagi’s statement, I don’t believe for a second she is embarrassed or thinks she was foolish. She said that for PR purposes. Privately, she and her 14 friends and their parents and their friends and friends’ parents throughout the community are high-fiving them and cheering them on. Just like they did at the Ford engine plant on 9/11.